In the now classic How to Read a Book, Mortimer Adler, the author of the Great Books movement, wrote that “wonder is the beginning of wisdom in learning from books as well as from nature.” Clyde Kilby (1902-1986) was no stranger to wonder or to nature. As the title of this collection emphasizes, it is precisely Kilby’s natural predilection for the wonder of God in nature, and in all life, that attracted him to the authors he eventually established at Wheaton College’s Marion E. Wade Center. For readers unfamiliar with his extensive legacy, Kilby is responsible for starting the Wade Center and, as its first director, growing the now unprecedented collection into a home for world-class scholarship on the seven authors whose materials are housed there: C. S. Lewis, J. R. R. Tolkien, Charles Williams, Dorothy Sayers, Owen Barfield, G. K. Chesterton, and George MacDonald. Like the eclectic collection at the Wade Center, A Well of Wonder pulls together an eclectic selection of Kilby’s essays, discussions, talks, and interviews (some of which were unpublished during Kilby’s lifetime) into one volume of a two-volume series. A companion volume including Kilby’s reflections on the Arts and the Christian Imagination, as the book is titled, is forthcoming to compliment Well of Wonder. For those, like me, who were unfortunate enough not to have known Kilby, but who have benefited from the Wade Center, this book is a breath of welcome air, firing the imagination that Kilby spent so much time exploring. The poem opening the book by poet Luci Shaw, a former pupil of Kilby and graduate of Wheaton College where he worked, is exceptional in setting the tone for the work. The acknowledgement, as again referenced in the introduction by Loren Wilkinson, situates Kilby as a “doorkeeper” to the imagination, to the myths that point us to God, and to the joy that reading deep Christian writers engenders. To spend time in Well of Wonder is to linger in the halls of kings from Narnia, Middle Earth, and far off planets. This well-conceived collection of artifacts is, as Kilby often points out in his analyses, ordered carefully around more than just individual persons, but around the growing feeling of myth that pervades all. Editors Loren Wilkinson and Keith Call carefully divided the volume into three sections: one on C. S. Lewis, one on J. R. R. Tolkien, and one on the Inklings. The wealth of experience, insight, childlike wonder, and personal correspondence that Kilby possessed in kind with Lewis and Tolkien alone make this book worth reading. Kilby’s words walk with readers through his experiences meeting, corresponding with, reading, and teaching about C. S. Lewis with generations of college students. In this section, “C. S. Lewis on Theology and the Witness of Literature,” Kilby’s insights range from Lewis’s depth in myth; his wit and fate among his contemporary theologians; to his joy, imagination, and lifelong pursuit of holiness. Kilby does not disappoint with the complexity he offers behind his clear sketches of Lewis. Section two highlights Kilby’s relationship with Tolkien. Kilby’s time spent with Tolkien trying to bring The Silmarillion to print is recounted with clarity and excitement, placing the reader in the midst of sitting and talking with Tolkien, searching through his vast knowledge, scattered papers, and endless conversation. Readers feel Kilby’s sadness at the death of Tolkien and the unrealized publication of The Silmarillion. (Contemporary readers have Tolkien’s son Christopher to thank for bringing many of the previously unpublished works of Middle Earth to light, including The Silmarillion now in multiple editions.) In addition to recounting his time with Tolkien, Kilby extends his analysis of The Lord of the Rings to bring out its own mythic qualities and the underlying incarnational aesthetic that alone provides so much of the power inherent in the myth of “middle earth,” a medieval term renewed by Tolkien. Kilby’s conversations with Tolkien provide the background from which Kilby is able to offer depth upon depth in his words of otherworldly wisdom. It is that same conversational quality that pervades all of the chapters in this volume. The third part of Well of Wonder offers Kilby’s reflections on a growing interest (his own and others) in Charles Williams, whose imagination was brought to bear on a substantial Christian theology. 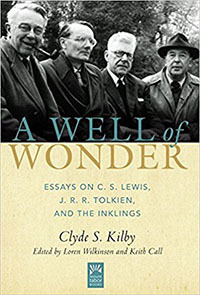 After essays on Williams, Kilby’s work provides inescapable insights into the relationship between Lewis, Tolkien, and Williams, moving eventually into overviews of Dorothy Sayers, and on to the other authors whose work has made the Wade Center a harbor of scholarship. What ties these final chapters together is Kilby’s consistent theme of the power of the Christian imagination in capturing myth, and more importantly what exists behind the myths we sub-create that are, to paraphrase Lewis, shafts of the eternal glory breaking into the human world. The primary benefits of this book, itself so full of wonder, are Kilby’s keen attention to these authors, his clearly perceptible joy at reading and sharing them with Christians worldwide, and his undeniable ability to capture the heart of these writers, which in turn pays them the greatest compliment by encouraging in his own audience a desire to read (or reread) Lewis, Tolkien, Williams, Sayers, Chesterton, MacDonald, and Barfield for themselves. The book’s only weakness appears for readers well versed in C. S. Lewis in particular. The first section of the book provides much from Kilby’s early writings, when he was, like Lewis, an apologist to those who doubted the power and possibilities offered by these British, Christian authors not yet claimed by Evangelicals. The nature of Kilby’s audience in these early essays required a substantial level of summary of Lewis’s works and repetition of those summaries. This is not truly a weakness, however, when one considers these uninitiated audiences Kilby addressed, the similarly unfamiliar audience to whom Well of Wonder is intended, as well as the substantial understanding that Kilby brings to these seemingly simple summaries. Well of Wonder is well worth reading, both for its intended audience unfamiliar with these Wade Center authors, and for those whose long journey has provided many hours of intimate conversation with Lewis, Tolkien, and the Inklings. Well of Wonder reads quickly precisely because of the ease of Kilby’s conversational style maintained throughout. Readers who complete the entire volume will not be disappointed, but may wish at the end to start again at the beginning, and return to the very authors Kilby spent his life championing. That calling, for Kilby, was due to the mythic quality of these authors to capture and communicate the substance of their lived faiths in the Triune God through such a large variety of genres. They all, indeed, portrayed Dorothy Sayers’s claim that Christian writing should be Trinitarian and incarnational, should rise out of a deep faith in God, undeniably evident under the surface of the narrative itself. Kilby’s own words mirror that same depth. Toby F. Coley is assistant professor of English at the University of Mary Hardin-Baylor.